Mars is one of the brightest objects in the night sky. It has been known since ancient times. The planet is named for the Roman God of War. It has two moons, Phobos (fear) and Deimos (panic). The moons get their scary names from the horses that pulled the chariot of the Greek god Ares. Mars is the fourth planet from the Sun. It is sometimes called the 'Red Planet' because of its red soil. 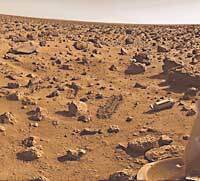 The soil on Mars is red because it contains iron oxide (rust). The red planet Mars has inspired wild flights of imagination over the centuries, as well as intense scientific interest. Whether fancied to be the source of hostile invaders of Earth, the home of a dying civilization, or a rough-and-tumble mining colony of the future, Mars provides fertile ground for science fiction writers, based on seeds planted by centuries of scientific observations. We know that Mars is a small rocky body once thought to be very Earth-like. Like the other "terrestrial" planets - Mercury, Venus, and Earth - its surface has been changed by volcanism, impacts from other bodies, movements of its crust, and atmospheric effects such as dust storms. It has polar ice caps that grow and recede with the change of seasons; areas of layered soils near the Martian poles suggest that the planet's climate has changed more than once, perhaps caused by a regular change in the planet's orbit. Martian tectonism - the formation and change of a planet's crust - differs from Earth's. Where Earth tectonics involve sliding plates that grind against each other or spread apart in the seafloors, Martian tectonics seem to be vertical, with hot lava pushing upwards through the crust to the surface. Periodically, great dust storms engulf the entire planet. The effects of these storms are dramatic, including giant dunes, wind streaks, and wind-carved features. Scientists believe that 3.5 billion years ago, Mars experienced the largest known floods in the solar system. This water may even have pooled into lakes or shallow oceans. But where did the ancient flood water come from, how long did it last, and where did it go? In May 2002, scientists announced the discovery of a key piece in the puzzle: the Mars Odyssey spacecraft had detected large quantities of water ice close to the surface - enough to fill Lake Michigan twice over. The ice is mixed into the soil only a meter (about 3 feet) below the surface of a wide area near the Martian south pole. Many questions remain. At present, Mars is too cold and its atmosphere is too thin to allow liquid water to exist at the surface for long. More water exists frozen in the polar ice caps, and enough water exists to form ice clouds, but the quantity of water required to carve Mars' great channels and flood plains is not evident on - or near - the surface today. Images from NASA's Mars Global Surveyor spacecraft suggest that underground reserves of water may break through the surface as springs. The answers may lie deep beneath Mars' red soil. Unraveling the story of water on Mars is important to unlocking its past climate history, which will help us understand the evolution of all planets, including our own. Water is also believed to be a central ingredient for the initiation of life; the evidence of past or present water on Mars is expected to hold clues about past or present life on Mars, as well as the potential for life elsewhere in the universe. And, before humans can safely go to Mars, we need to know much more about the planet's environment, including the availability of resources such as water. Mars has some remarkable geological characteristics, including the largest volcanic mountain in the solar system, Olympus Mons (27 km high and 600 km across); volcanoes in the northern Tharsis region that are so huge they deform the planet's roundness; and a gigantic equatorial rift valley, the Valles Marineris. This canyon system stretches a distance equivalent to the distance from New York to Los Angeles; Arizona's Grand Canyon could easily fit into one of the side canyons of this great chasm. Like the other planets in the solar system, Mars travels around the sun in an elliptical (oval) orbit. But the orbit of Mars is slightly more "stretched out" than the orbits of Earth and most of the other planets. The distance from Mars to the sun can be as little as about 128,390,000 miles (206,620,000 kilometers) or as much as about 154,860,000 miles (249,230,000 kilometers). Mars travels around the sun once every 687 Earth days; this is the length of the Martian year. The distance between Earth and Mars depends on the positions of the two planets in their orbits. It can be as small as about 33,900,000 miles (54,500,000 kilometers) or as large as about 249,000,000 miles (401,300,000 kilometers). Like Earth, Mars rotates on its axis from west to east. The Martian solar day is 24 hours 39 minutes 35 seconds long. This is the length of time that Mars takes to turn around once with respect to the sun. The Earth day of 24 hours is also a solar day. The axis of Mars is not perpendicular to the planet's orbital plane, an imaginary plane that includes all points in the orbit. Rather, the axis is tilted from the perpendicular position. The angle of the tilt, called the planet's obliquity, is 25.19¡ for Mars, compared with 23.45¡ for Earth. The obliquity of Mars, like that of Earth, causes the amount of sunlight falling on certain parts of the planet to vary widely during the year. As a result, Mars, like Earth, has seasons. 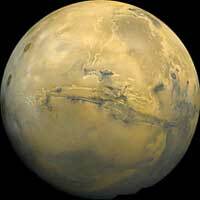 Mars has a mass (amount of matter) of 7.08 X 1020 tons (6.42 X 1020 metric tons). The latter number would be written out as 642 followed by 18 zeroes. Earth is about 10 times as massive as Mars. 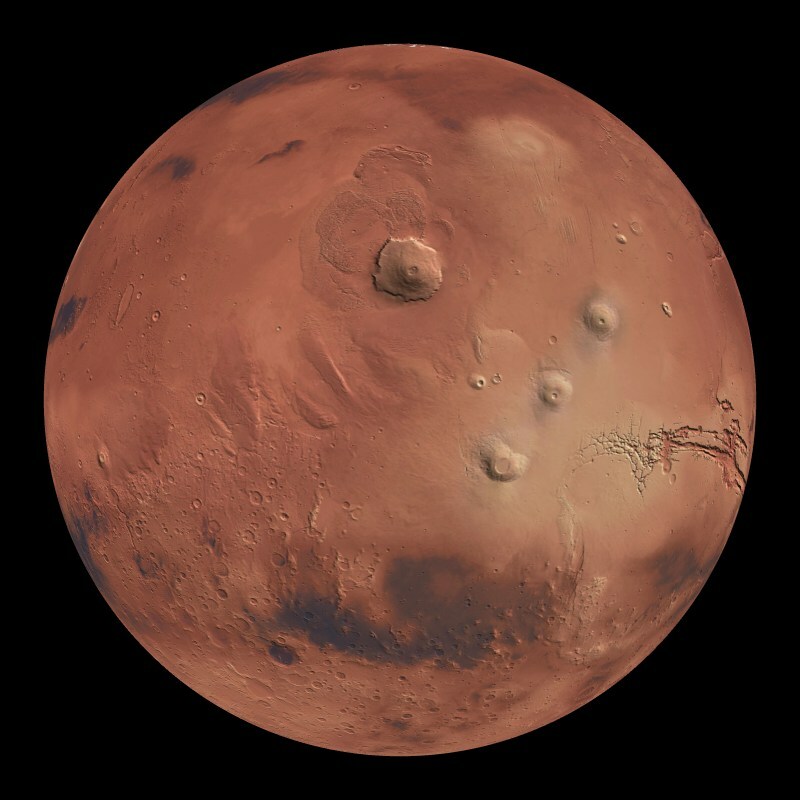 Mars's density (mass divided by volume) is about 3.933 grams per cubic centimeter. This is roughly 70 percent of the density of Earth. Because Mars is so much smaller and less dense than Earth, the force due to gravity at the Martian surface is only about 38 percent of that on Earth. Thus, a person standing on Mars would feel as if his or her weight had decreased by 62 percent. And if that person dropped a rock, the rock would fall to the surface more slowly than the same rock would fall to Earth. Scientists do not yet know much about the interior of Mars. A good method of study would be to place a network of motion sensors called seismometers on the surface. Those instruments would measure tiny movements of the surface, and scientists would use the measurements to learn what lies beneath. Researchers commonly use this technique to study Earth's interior. Scientists have four main sources of information on the interior of Mars: (1) calculations involving the planet's mass, density, gravity, and rotational properties; (2) knowledge of other planets; (3) analysis of Martian meteorites that fall to Earth; and (4) data gathered by orbiting space probes. They think that Mars probably has three main layers, as Earth has: (1) a crust of rock, (2) a mantle of denser rock beneath the crust, and (3) a core made mostly of iron. Scientists suspect that the average thickness of the Martian crust is about 30 miles (50 kilometers). Most of the northern hemisphere lies at a lower elevation than the southern hemisphere. Thus, the crust may be thinner in the north than in the south. Much of the crust is probably composed of a volcanic rock called basalt (buh SAWLT). Basalt is also common in the crusts of Earth and the moon. Some Martian crustal rocks, particularly in the northern hemisphere, may be a form of andesite. Andesite is also a volcanic rock found on Earth, but it contains more silica than basalt does. Silica is a compound of silicon and oxygen. The mantle of Mars is probably similar in composition to Earth's mantle. Most of Earth's mantle rock is peridotite (PEHR uh DOH tyt), which is made up chiefly of silicon, oxygen, iron, and magnesium. The most abundant mineral in peridotite is olivine (OL uh veen). The main source of heat inside Mars must be the same as that inside Earth: radioactive decay, the breakup of the nuclei of atoms of elements such as uranium, potassium, and thorium. Due to radioactive heating, the average temperature of the Martian mantle may be roughly 2700 degrees F (1500 degrees C). Mars probably has a core composed of iron, nickel, and sulfur. The density of Mars gives some indication of the size of the core. Mars is much less dense than Earth. Therefore, the radius of Mars's core relative to the overall radius of Mars must be smaller than the radius of Earth's core relative to the overall radius of Earth. The radius of the Martian core is probably between 900 and 1,200 miles (1,500 and 2,000 kilometers). Unlike Earth's core, which is partially molten (melted), the core of Mars probably is solid. Scientists suspect that the core is solid because Mars does not have a significant magnetic field. A magnetic field is an influence that a magnetic object creates in the region around it. Motion within a planet's molten core makes the core a magnetic object. The motion occurs due to the rotation of the planet. Data from Mars Global Surveyor show that some of the planet's oldest rocks formed in the presence of a strong magnetic field. Thus, in the distant past, Mars may have had a hotter interior and a molten core. Mars has many of the kinds of surface features that are common on Earth. These include plains, canyons, volcanoes, valleys, gullies, and polar ice. But craters occur throughout the surface of Mars, while they are rare on Earth. In addition, fine-grained reddish dust covers almost all the Martian surface. Many regions of Mars consist of flat, low-lying plains. Most of these areas are in the northern hemisphere. The lowest of the northern regions are among the flattest, smoothest places in the solar system. They may be so smooth because they were built up from deposits of sediment (tiny particles that settle to the bottom of a liquid). There is ample evidence that water once flowed across the Martian surface. The water would have tended to collect in the lowest spots on the planet and thus would have deposited sediments there. Along the equator lies one of the most striking features on the planet, a system of canyons known as the Valles Marineris. The name is Latin for Valleys of Mariner; a space probe called Mariner 9 discovered the canyons in 1971. The canyons run roughly east-west for about 2,500 miles (4,000 kilometers), which is close to the width of Australia or the distance from Philadelphia to San Diego. 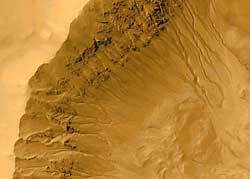 Scientists believe that the Valles Marineris formed mostly by rifting, a splitting of the crust due to being stretched. Individual canyons of the Valles Marineris are as much as 60 miles (100 kilometers) wide. The canyons merge in the central part of the system, in a region that is as much as 370 miles (600 kilometers) wide. The depth of the canyons is enormous, reaching 5 to 6 miles (8 to 10 kilometers) in some places. Large channels emerge from the eastern end of the canyons, and some parts of the canyons have layered sediments. The channels and sediments indicate that the canyons may once have been partly filled with water. Mars has the largest volcanoes in the solar system. The tallest one, Olympus Mons (Latin for Mount Olympus), rises 17 miles (27 kilometers) above the surrounding plains. It is about 370 miles (600 kilometers) in diameter. 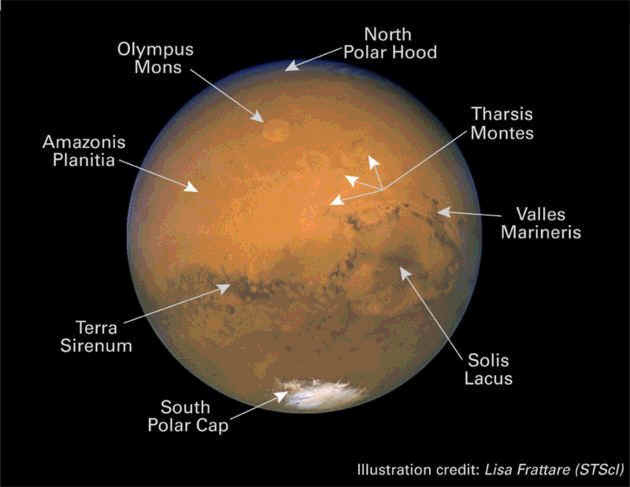 Three other large volcanoes, called Arsia Mons, Ascraeus Mons, and Pavonis Mons, sit atop a broad uplifted region called Tharsis. All these volcanoes have slopes that rise gradually, much like the slopes of Hawaiian volcanoes. Both the Martian and Hawaiian volcanoes are shield volcanoes. They formed from eruptions of lavas that can flow for long distances before solidifying. Mars also has many other types of volcanic landforms. These range from small, steep-sided cones to enormous plains covered in solidified lava. Scientists do not know how recently the last volcano erupted on Mars -- some minor eruptions may still occur. Many meteoroids have struck Mars over its history, producing impact craters. Impact craters are rare on Earth for two reasons: (1) Those that formed early in the planet's history have eroded away, and (2) Earth developed a dense atmosphere, preventing meteorites that could have formed craters from reaching the planet's surface. Martian craters are similar to craters on Earth's moon, the planet Mercury, and other objects in the solar systems. The craters have deep, bowl-shaped floors and raised rims. Large craters can also have central peaks that form when the crater floor rebounds upward after an impact. On Mars, the number of craters varies dramatically from place to place. Much of the surface of the southern hemisphere is extremely old, and so has many craters. Other parts of the surface, especially in the northern hemisphere, are younger and thus have fewer craters. Some volcanoes have few craters, indicating that they erupted recently. The lava from the volcanoes would have covered any craters that existed at the time of the eruptions. And not enough time has passed since the eruptions for many new craters to form. Some of the impact craters have unusual-looking deposits of ejecta, material thrown out of the craters at impact. These deposits resemble mudflows that have solidified. This appearance suggests that the impacting bodies may have encountered water or ice beneath the ground. Mars has a few large impact craters. The largest is Hellas Planitia in the southern hemisphere. Planitia is a Latin word that can mean low plain or basin; Hellas Planitia is also known as the Hellas impact basin. The crater has a diameter of about 1,400 miles (2,300 kilometers). The crater floor is about 5.5 miles (9 kilometers) lower than the surrounding plain. Channels, valleys, and gullies occur in many regions of Mars, apparently as a result of water erosion. The most striking of these features are known as outflow channels. These channels can be as wide as 60 miles (100 kilometers) and as long as 1,200 miles (2,000 kilometers). They appear to have been carved by enormous floods that rushed across the surface. In many cases, the water seems to have escaped suddenly from underground. Many of the channels do not look like river systems on Earth, with the main river formed from smaller rivers and streams. Rather, those Martian channels arise fully formed from low-lying areas. Other regions of Mars have much smaller features called valley networks. These networks look more like river systems on Earth. Martian valley networks are up to a few miles or kilometers wide and up to a few hundred miles or kilometers long. The networks are mostly ancient features. They suggest that the Martian climate may once have been warm enough to enable water to exist as a liquid.The gullies are smaller still. Most of them lie at high latitudes. They may be a result of a leakage of a small amount of ground water to the surface within the past few million years. The most interesting features in the polar regions of Mars are thick stacks of finely layered deposits of material. Scientists believe that the layers consist of mixtures of water ice and dust. The deposits extend from the poles to latitudes of about 80 degrees in both hemispheres. The atmosphere probably deposited the layers over long periods. The layers may provide evidence of seasonal weather activity and long-term changes in the Martian climate. One possible cause of climate changes is variation in the planet's obliquity. This variation alters the amount of sunlight falling on different parts of Mars. The variation in sunlight, in turn, may change the climate. Past climate changes could have affected the rate at which the atmosphere deposited dust and ice into layers. Lying atop much of the layered deposits in both hemispheres are caps of water ice that remain frozen all year. The layers and overlying caps are several miles or kilometers thick. In the wintertime, additional seasonal caps form from layers of frost. The seasonal caps are clearly visible through Earth-based telescopes. The frost consists of solid carbon dioxide (CO2) -- also known as "dry ice" -- that has condensed from CO2 gas in the atmosphere. In the deepest part of the winter, the frost extends from the poles to latitudes as low as 45 degrees -- halfway to the equator. The atmosphere of Mars contains much less oxygen (O2) than that of Earth. The O2 content of the Martian atmosphere is only 0.13 percent, compared with 21 percent in Earth's atmosphere. Carbon dioxide makes up 95.3 percent of the gas in the atmosphere of Mars. Other gases include nitrogen (N2), 2.7 percent; argon (Ar), 1.6 percent; carbon monoxide (CO), 0.07 percent; and water vapor (H2O), 0.03 percent. 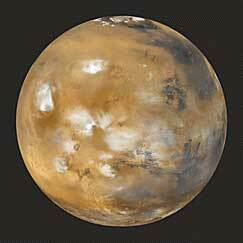 At the surface of Mars, the atmospheric pressure is typically only about 0.10 pound per square inch (0.7 kilopascal). This is roughly 0.7 percent of the atmospheric pressure at Earth's surface. When the seasons change on Mars, the atmospheric pressure at the surface there varies by 20 to 30 percent. Each winter, the condensation of CO2 at the poles removes much gas from the atmosphere. When this happens, the atmospheric pressure due to CO2 gas decreases sharply. The opposite process occurs each summer. In addition, the atmospheric pressure varies as the weather changes during the day, much as on Earth. 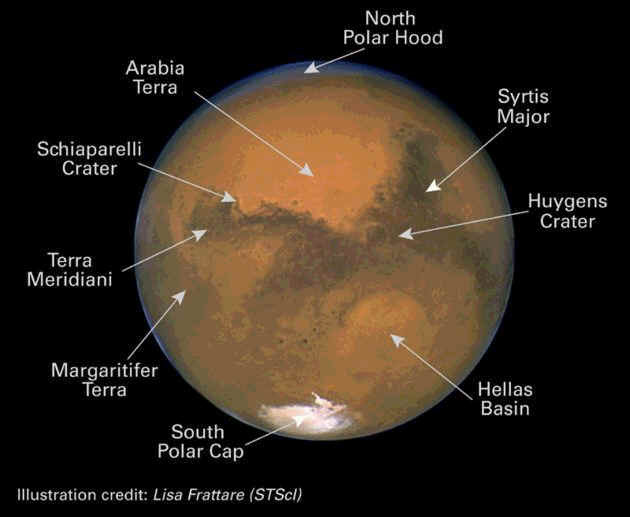 The atmosphere of Mars is coldest at high altitudes, from about 40 to 78 miles (65 to 125 kilometers) above the surface. At those altitudes, typical temperatures are below -200 degrees F (-130 degrees C). The temperature increases toward the surface, where daytime temperatures of -20 to -40 degrees F (-30 to -40 degrees C) are typical. In the lowest few miles or kilometers of the atmosphere, the temperature varies widely during the day. It can reach -150 degrees F (-100 degrees C) late at night, even near the equator. Atmospheric temperatures can be warmer than normal when the atmosphere contains much dust. The dust absorbs sunlight and then transfers much of the resulting heat to the atmospheric gases. In the Martian atmosphere, thin clouds made up of particles of frozen CO2 can form at high altitudes. In addition, clouds, haze, and fog composed of particles of water ice are common. Haze and fog are especially frequent in the early morning. At that time, temperatures are the lowest, and water vapor is therefore most likely to condense. The Martian atmosphere, like that of Earth, has a general circulation, a wind pattern that occurs over the entire planet. Scientists have studied the global wind patterns of Mars by observing the motions of clouds and changes in the appearance of wind-blown dust and sand on the surface. Global-scale winds occur on Mars as a result of the same process that produces such winds on Earth. The sun heats the atmosphere more at low latitudes than at high latitudes. At low latitudes, the warm air rises, and cooler air flows in along the surface to take its place. The warm air then travels toward the cooler regions at higher latitudes. At the higher latitudes, the cooler air sinks, then travels toward the equator. On Mars, the condensation and evaporation of CO2 at the poles influence the general circulation. When winter begins, atmospheric CO2 condenses at the poles, and more CO2 flows toward the poles to take its place. When spring arrives, CO2 frost evaporates, and the resulting gas flows away from the poles. Surface winds on Mars are mostly gentle, with typical speeds of about 6 miles (10 kilometers) per hour. Scientists have observed wind gusts as high as 55 miles (90 kilometers) per hour. However, the gusts exert much less force than do equally fast winds on Earth. The winds of Mars have less force because of the lower density of the Martian atmosphere. Some of the most spectacular weather occurs on Mars when dust blows in the wind. Small, swirling winds can lift dust off the surface for brief intervals. These winds create dust devils, tiny storms that look like tornadoes. Large dust storms begin when wind lifts dust into the atmosphere. The dust then absorbs sunlight, warming the air around it. As the warmed air rises, more winds occur, lifting still more dust. As a result, the storm becomes stronger. At larger scales, dust storms can blanket areas from more than 200 miles (320 kilometers) to a few thousand miles or kilometers across. The largest storms can cover the entire surface of Mars. Storms of that size are unusual, but they can last for months. The strongest storms can block almost the entire surface from view. Such storms occurred in 1971 and 2001. Dust storms are most common when Mars is closest to the Sun. More storms occur then because that is when the sun heats the atmosphere the most. Mars has two tiny moons, Phobos and Deimos. The American astronomer Asaph Hall discovered them in 1877 and named them for the sons of Ares. Both satellites are irregularly shaped. The largest diameter of Phobos is about 17 miles (27 kilometers); that of Deimos, about 9 miles (15 kilometers). The two satellites have many craters that formed when meteoroids struck them. The surface of Phobos also has a complicated pattern of grooves. These may be cracks that developed when an impact created the satellite's largest crater. Scientists do not know where Phobos and Deimos formed. They may have come into existence in orbit around Mars at the same time the planet formed. Another possibility is that the satellites formed as asteroids near Mars. The gravitational force of Mars then pulled them into orbit around the planet. The color of both satellites is a dark gray that is similar to the color of some kinds of asteroids. Scientists know generally how Mars evolved after it formed about 4.6 billion years ago. Their knowledge comes from studies of craters and other surface features. Features that formed at various stages of the planet's evolution still exist on different parts of the surface. Researchers have developed an evolutionary scenario that accounts for the sizes, shapes, and locations of those features. Researchers have ranked the relative ages of surface regions according to the number of impact craters observed. The greater the number of craters in a region, the older the surface there. However, scientists have not yet determined exactly when the various evolutionary stages occurred. To do that, they would need to know the ages of rocks of surface features representing those stages. They could determine how old such rocks are if they could analyze samples of them in a laboratory. But no space probe has ever brought Martian rocks to Earth. Scientists have divided the "lifetime" of Mars into three periods. From the earliest to the most recent, the periods are: (1) The Noachian (noh AY kee uhn), (2) the Hesperian, and (3) the Amazonian. Each period is named for a surface region that was created during that period. The Noachian Period is named for Noachis Terra, a vast highland in the southern hemisphere. During the Noachian Period, a tremendous number of rocky objects of all sizes, ranging from small meteoroids to large asteroids, struck Mars. The impact of those objects created craters of all sizes. The Noachian was also a time of great volcanic activity. In addition, water erosion probably carved the many small valley networks that mark Mars's surface during the Noachian Period. The presence of those valleys suggests that the climate may have been warmer during the Noachian Period than it is today. The intense meteoroid and asteroid bombardment of the Noachian Period gradually tapered off, marking the beginning of the Hesperian Period. This period is named for Hesperia Planum, a high plain in the lower latitudes of the southern hemisphere. During the Hesperian Period, volcanic activity continued. Volcanic eruptions covered over Noachian craters in many parts of Mars. Most of the largest outflow channels on the planet are of Hesperian age. The Amazonian Period, which is characterized by a low rate of cratering, continues to this day. The period is named for Amazonis Planitia, a low plain that is in the lower latitudes of the northern hemisphere. Volcanic activity has occurred throughout the Amazonian Period, and some of the largest volcanoes on Mars are of Amazonian age. The youngest geologic materials on Mars, including the ice deposits at the poles, are also Amazonian. Mars might once have harbored life, and living things might exist there even today. Mars almost certainly has three ingredients that scientists believe are necessary for life: (1) chemical elements such as carbon, hydrogen, oxygen, and nitrogen that form the building blocks of living things, (2) a source of energy that living organisms can use, and (3) liquid water. The essential chemical elements likely were present throughout the planet's history. Sunlight could be the energy source, but a second source of energy could be the heat inside Mars. On Earth, internal heat supports life in the deep ocean and in cracks in the crust. Liquid water apparently carved Mars's large channels, its smaller valleys, and its young gullies. In addition, there are vast quantities of ice within about 3 feet (1 meter) of the surface near the south pole and perhaps near the north pole. Thus, water apparently has existed near the surface over much of the planet's history. And water is probably present beneath the surface today, kept liquid by Mars's internal heat. In 1996, scientists led by David S. McKay, a geologist at the National Aeronautics and Space Administration's Johnson Space Center in Houston, reported that scientists there had found evidence of microscopic Martian life. They discovered this evidence inside a meteorite that had made its way to Earth. The meteorite had been blasted from the surface of Mars, almost certainly by the impact of a much larger meteorite. The small meteorite had then journeyed to Earth, attracted by Earth's gravity. The trip may have taken millions of years. The evidence included complex organic molecules, grains of a mineral called magnetite that can form within some kinds of bacteria, and tiny structures that resemble fossilized microbes. The scientists' conclusions are controversial, however. There is no general scientific agreement that Mars has ever harbored life. Mars has two small moons: Phobos and Deimos. Phobos (fear) and Deimos (panic) were named after the horses that pulled the chariot of the Greek war god Ares, the counterpart to the Roman war god Mars. Both Phobos and Deimos were discovered in 1877 by American astronomer Asaph Hall. The moons appear to have surface materials similar to many asteroids in the outer asteroid belt, which leads most scientists to believe that Phobos and Deimos are captured asteroids. By Comparison: If you weigh 100 pounds on Earth, you would weigh 38 pounds on Mars. By Comparison: Earth's rotation period is 23.934 hours. By Comparison: CO2 is responsible for the Greenhouse Effect and is used for carbonation in beverages. N2 is 80% of Earth's air and is a crucial element in DNA. Ar is used to make blue neon light blubs.